Matt Ryan is a self-proclaimed fitness addict. He dedicates hours of his free time to his fitness and arthritis through exercising, bodybuilding, and studying to become a personal trainer. 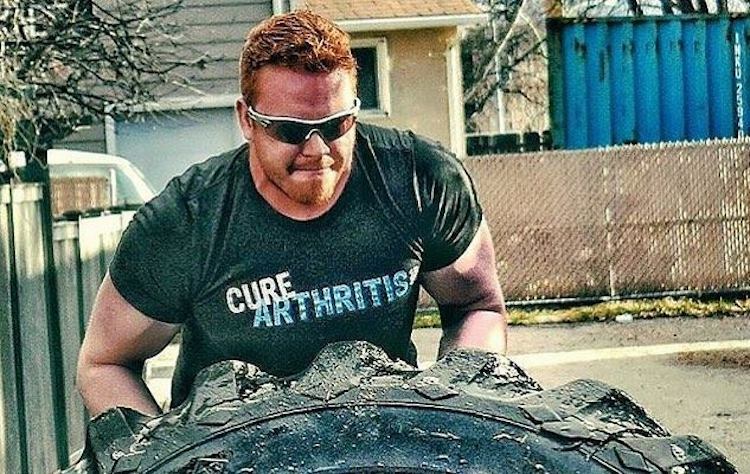 If you were to see Matt sweating it out in the gym, you would never guess he suffers from ankylosing spondylitis, psoriatic arthritis, and Crohn’s & Colitis. Matt has been active his entire life, starting by playing basketball throughout his grade school years. As with any sport, he sustained his fair share of injuries. However, he admits that he often ignored doctor’s orders and rushed back on the court, only to exacerbate his injuries and slow down his recovery time. Injury after injury, Matt’s right knee became so worn down that he was forced to have surgery on it at the age of 20. A few hours after going under the knife, nurses helped Matt up from his bed to take him to the restroom, only to result shattered bones. From that point on, Matt’s life was severely altered. He was scheduled for another surgery, but before he could even make it to the second repair, he woke up one morning in so much pain that he could not move. He was rendered practically immobile, confined to his bed. Unable to get up to shower, dress himself, or even eat, Matt dropped 65 pounds, a shell of the athletic basketball star he was previously. After several months of excruciating pain, he was diagnosed with arthritis at the age of 21. While Matt’s injuries did not cause his arthritis, his doctors speculate that the traumatic injury triggered an autoimmune response in his body. He tested positive for the HLA B27 gene, which usually indicates ankylosing spondylitis. From that point on, Matt worked with his doctors to set up a treatment plan. He currently uses Prednisone, Remicade, and Methotrexate to manage his arthritis pain. While medications play an important role in managing Matt’s pain, his biggest takeaway in his battle with arthritis is that a healthy lifestyle has greatly increased his personal quality of life. He spends his days working a full-time job, but the second he clocks out, he comes alive. It’s straight to the gym, where he will spend several hours of his afternoon stretching and lifting weights. “I follow a typical bodybuilding week of working one major muscle group per day,” he says, with arms and chest as his favorite muscle groups to exercise. But not all lifts are without limitations. “Due to my disease, I cannot perform extremely heavy Olympic lifts like a CrossFit routine. My routine is more geared towards the “physique” class of bodybuilding.” Matt knows his restrictions, so he tries to give it his all on the lifts that he can safely perform. In addition, Matt pays particular attention to the food he puts in his body. This not only aids his fitness goals, but also to avoid foods that may cause inflammation in his joints. Although he is strict with diet and exercise, Matt is cognizant of how his body reacts, aware that he can’t always push himself to the brink. Matt recalls the days when he couldn’t even eat or get dressed without assistance, when fitness and arthritis were an unlikely combination. He uses these memories as a reminder to keep moving while he is capable of doing so. Through the course of his disease, Matt has learned countless lessons and how to juggle both fitness and arthritis. The only caveat Matt faced was a lack of people in similar situations as him. Now, he wants to help others realize their capabilities by becoming a fitness trainer and a spokesperson for his disease. When he is not working or exercising, he devotes his time to studying nutrition and the human body to become a personal trainer. While he knows his disease doesn’t make things easier, he feels that he can make the best out of his given situation by uplifting others and spreading awareness along the way. With the help of the Arthritis National Research Foundation and Racing For A Cure, Matt hopes he can motivate a community that has given him an unlimited source of inspiration and support.